I’m lactose intolerant. This is one of the hardest things for me around the holidays because it seems like EVERYTHING has dairy in it. Last year, I went on the hunt for a healthier alternative to my favorite holiday dish: green bean casserole. I did find a recipe that avoids heavy creams and too much cheese. This recipe is low in fat and calories, while staying high in fiber and calcium. Personally, I believe this recipe is better than the original recipes which use heavy creams. By using low fat milk and taking out the cream of mushroom soup, you’re cutting out about 150 calories per serving. Which is one less thing we need to worry about this holiday season! Preheat your oven to 425°. Make sure your racks are on the highest and lowest levels. Toss your green beans with a tablespoon of the olive oil until completely covered. Place them on a baking sheet (or two if they don’t fit). Roast them for ten minutes, rotate the baking sheet, then roast for another 10 minutes. Heat one tablespoon of olive oil in a medium saucepan, then add your sliced onion. Stir this frequently until the onion is golden brown, then add the flour, salt, and pepper. Cook together for another minute while stirring. Add the milk to this mixture and continue stirring to scrape up the pieces that may be stuck to the pan. You can add herbs to this mixture, since after about 4 minutes of stirring you’ll have your milk sauce. Remove the roasted green beans and start your broiler. 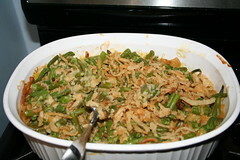 Place half of the green beans into a broiler-safe casserole dish. Cover the green beans with half of the milk sauce. Add the rest of the green beans, then the rest of the sauce. Sprinkle the breadcrumb/cheese mixture on top of the green beans, then broil for 5 minutes at the most. It is important to keep a close eye on this step. You’ll want to take the casserole out of the oven when it begins to bubble and brown at the top. Because my stomach isn’t too sensitive to dairy, I’m allowed to have a cup or two of skim milk a day before it gets upset with me. Using fat free milk and cheese in this recipe is a life saver because I actually get to enjoy my favorite dish without suffering the rest of the night or taking my Lactaid pills. This recipe is good for those trying to shave off a few calories from their Thanksgiving meal and those who want a healthy alternative from the creaminess that is usually green bean casserole. Like I said, if I can find an easier way to do this, I’ll let you all know. We could all spare to save a few minutes during the holiday season.